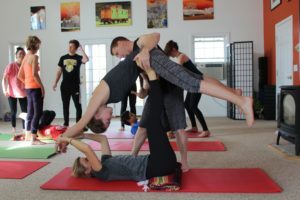 I love yoga, so when someone told me that I could go to an Acroyoga class, I was immediately on board even though I had no idea what it would entail. I had this image in my mind that it was going to be one of those things where people hung from ribbons on the ceiling and twisted themselves around. So when I arrived at the small farmhouse where the Serenity Yoga studio was and Marla Helton, owner of the studio and yoga instructor, asked us all to grab workout balls instead of ribbons to hang from the ceiling, I was confused. Helton told us to sit on the balls in order to get used to balancing with them. Then we were instructed to make a circle, put our hands on the knees of those sitting around us, and introduce ourselves to the class. I was and am accustomed to workout classes where you walk in with your head down, go about your workout, and never talk to the other participants; so needless to say, I was a little uncomfortable. When it came to me, I said my name, but I guess I mumbled it and people heard Admiral instead of Emma. So my new nickname for that class, and hopefully forever, was Admiral. After a few plank-type exercises using the ball to warm up our core, the instructors informed us a bit about what acroyoga was going to be like. There are three different positions in acroyoga: base, flyer and spotter. I stood there looking around, adjusting my shirt, and fidgeting nervously. The mere thought of being lifted off the ground by people I barely knew was terrifying, and the thought of lifting them or being responsible for falls made my face hot. The instructors demonstrated the exercises in groups of three, the purpose of the base always lifting the flyer with their legs and the spotter, making sure everyone was safe. Then, they made us split into groups and see what we could do. I just watched the first session, while two girls in my group lifted each other up rather quickly. Before I had even done work, I was sweating in anticipation. Then it was my turn. “I’ll be the base,” I said quickly. I was not ready to be lifted up just yet, so I figured it might be better to begin on the ground. My flyer stood in front of me, placed my feet on her hips, and then slowly began leaning into me. The first time we basically stopped because we were giggling. Neither of us had any idea of what this was supposed to feel like, so the whole thing was strange. But the second time, after we got our breath back from laughing, it was easier to lift her. I found that as long as I just pushed up with my legs and core, I would be okay and she wouldn’t fall. I realized that I was a lot stronger than I initially thought. I also found that I liked being in the position where I felt I had more control, which is what gave me so much trouble being a flyer. It took me three times to even get up on someone just because I was so afraid of giving myself over to someone else. But after I did, the whole class became easier. I could lift and be a better base because I knew what it was like to fly. And when I spotted, I knew what to look for to see if people were uncomfortable. By the end of the class, I wasn’t afraid of getting hurt; in fact, I was probably a little reckless in throwing myself around. It all seemed possible because there was enough instruction and people were looking out for each other. But the weirdest thing about this experience was that it was a sort of emotional therapy that I did not expect. I did not go into this class wanting to think about how I perceive myself and others. But when you are lifting another person in the air, it is hard to not think about what role you play for the people in your life. And when someone else is holding you up, you begin to think about how we need to trust friends and even strangers. The class not only makes your abs sore the next day, but it also gives you an emotional cleanse, which on most college campuses is something that can be much needed. The next scheduled acroyoga class is Nov. 19, and if you are interesting in trying it, getting out of your comfort zone, and throwing yourself around for a few hours, contact Molly Webster at mollywebster_2018@depauw.edu.